It's Thoughtful Thursday with My Creative Time, and today I had fun making a congratulations card for a friend who just won a big award! I started this card by taking a panel of watercolor cardstock and ink blending some Tim Holtz Distress Ink in Tumbled Glass in the center of it. After spritzing it with water, I flicked on droplets of Mermaid Lagoon and Ground Espresso inks that I had mixed with water. After this dried, I stamped on my sentiment ballon string, from the Script Words stamp set. I made my balloon with the smallest of the Stitched Circle Balloon Dies, ink blending it with Mermaid Lagoon ink. Be sure to stop by Emma's blog to see what she and others from the design team have for you today! 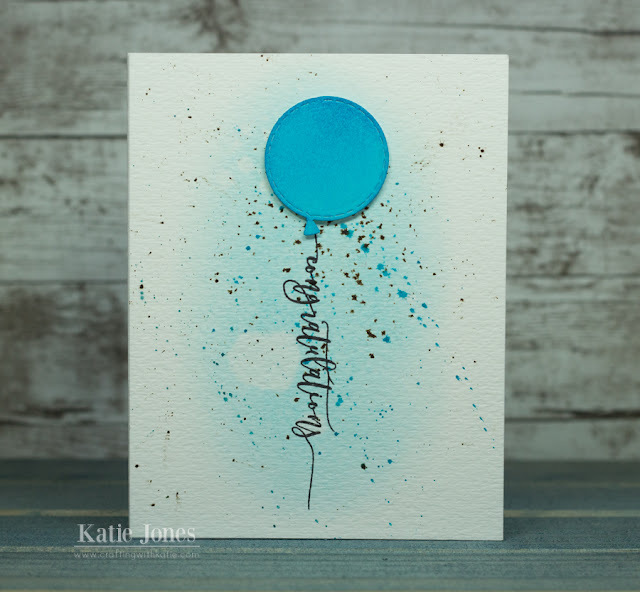 Very pretty card, Katie, love your distressed ink with flicking on the water paper. OMG Miss Katie What a Beautiful card. Love how you achieved that confetti look with your inks and water flicking...gosh the look is Spectacular. Love the ways you've used Miss Emma's goodies. You so did a Super Outstanding Creative job!! Congrats to your friend..they will love your card!! I like the confetti look the flicking ink makes on your background. So pretty to make a matching balloon and I love the look of the script words for the string! Great job. Love the simplicity of this card and the scripts word for the string. MCT 65th Edition Release Blog Hop & Sale!